Background: The poverty, low social-economic and malnutrition, all of these effects growth and neurological development in Syrian children, especially deficiency of some nutrients from animal source such as Vitamin B12. 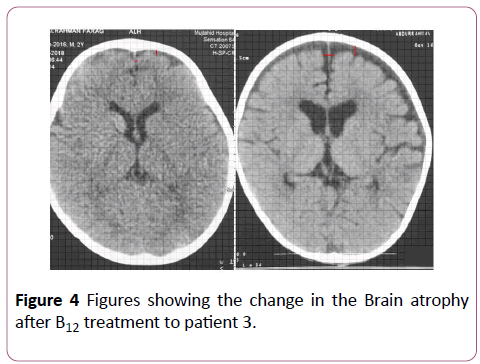 This study aimed to measure the maximal width between Sylvian fissures and measure the maximal width of the extra ventricular subarachnoid space were made in the frontal region in brain by CT or MRI before and after three months of starting treatment with Vitamin B12 in children (age under 3 year ) have neurological symptoms and brain atrophy before treatment. Methods: Cohort prospective study, children (n=32), between 1-1-2017 and 1-1-2018. This children (age under 3year) were admitted in our hospital and diagnosed with B12 deficiency, MRI or CT (20 MRI, 12 CT ) imaging before and after three months of starting treatment were performed. The upper limit of normal of Sylvian fissures and maximal width of the extra ventricular sub arachnoid space were made in the frontal region in children has been adopted as reported in neurologic paediatric book. 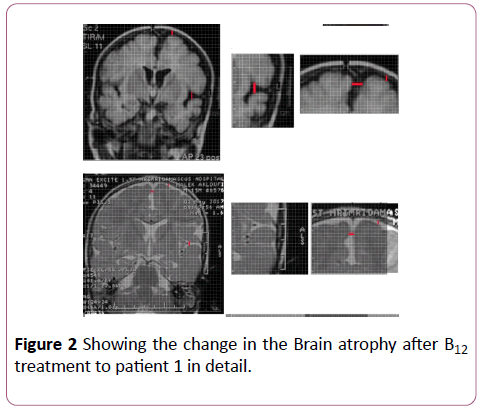 Results: Number of children with mild cerebral atrophy before treatment was 15 (46%) and SD 0.04 and 10 children with moderate cerebral atrophy (31.3%) SD 0.05, the number of children with severe brain atrophies before treatment 7 (21.9%) SD 0.13. The number of children who had normal distance between the sylvius fissures were 31; 96.9% and one child has moderate cerebral atrophy according to Sylvian fissures and no case is left with severe atrophy after treatment. Conclusion: The cerebral atrophy following the Vitamin B12 deficiency in children because of malnutrition or breast feeding from vegetarian mother reversible completely in early stages. An adequate Vitamin B12 status is crucial for the development of central nervous system in children , as shown by the clinical picture presented in children with inborn errors of cobalamin metabolism and cobalamin deficiency [2,3]. Although a rapid progress in motor development and improvement in clinical symptoms after cobalamin treatment have been reported [3,4], cobalamin deficiency during infancy, even when optimally treated, may result in permanent developmental disabilities . Vitamin B12 is rarely shown before the age of four months. The majority of cases were from vegetarians mothers who were dependent on breastfeeding between 6 and 12 months. This deficiency is characterized by central nervous system injury and severe cases of cerebral atrophy . Rapid brain growth during the first two years of age and the process of sheathed axons, which is concentrated during the middle of pregnancy until the second year of life but does not stop and continues until adulthood . Symptoms in older children may pretend eye movement disorders, inflammation of the tongue, pigmentation in the hands in severe cases of vitamin deficiency, epilepsy as a symptom at diagnosis suggests a more severe neurological injury . The study period was extended over a period of approximately one year. 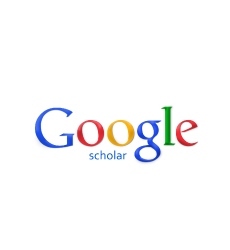 A prospective descriptive study was conducted on 32 children (16 males and 16 females). Children who visit the Damascus University Paediatric Hospital and diagnosed with Vitamin B12 deficiency based on the clinical story, the neurological examination, the Vitamin B12 serum concentration and blood smear. Images were executed with Philips machine 4 mm thickness before and after the treatment, Linear measurements were performed on standardized transverse slices with the use of SIENET Magic View 300-DICOM CD Browser Specified linear measurements on the selected transverse sections were taken, the longest possible distance between Sylvius fissures was measured before treatment and then the radiographic image was returned three months after the starting of the B12 (1000 mcg ) injection there by daily for two weeks and then a weekly for two months and then one injection monthly for two years. Children were classified by degrees of cerebral atrophy into three groups based on the normal maximum distance between Sylvian fissures in children (0-0.760 cm). Groups were classified as follows: severe cerebral atrophy ( ≥ 1.1 cm) moderate cerebral atrophy (0.910-1.1 cm) and mild cerebral atrophy (>0.760 and <0.910) cm. The children were again classified according to degrees of cerebral atrophy after treatment and comparison of results. For the measurements of the maximal width of the extra ventricular sub arachnoid space were made in the frontal region Groups were classified as follows. Upper limit of normal spaces is 0.580 cm, mild atrophy (>0.580 cm <0.90 cm) moderate atrophy (0.90 cm-1.10 cm) severe atrophy ≥ 1.1 cm). The upper limit of normal of Sylvian fissures and maximal width of the extra ventricular sub arachnoid space were made in the frontal region in children has been adopted as reported in Fenichel's clinical pediatric neurology book . Written informed consent was obtained from the mothers before enrolment. For parents of children who are unable to read and write, the research objective is explained to them and their oral consent is taken in the presence of a member of their family. All were assured that all data collected would be confidential and available for the researcher only. It was explained to the participants that they had the right to withdraw from the research any tests were free and the participants did not pay for it. Children with Vitamin B12 deficiency due to mal absorption, metabolic disease or surgical intervention in abdomen are excluded in our study. The cases included children who had vitamin deficiency due to breastfeeding of vegetarians and malnutrition. 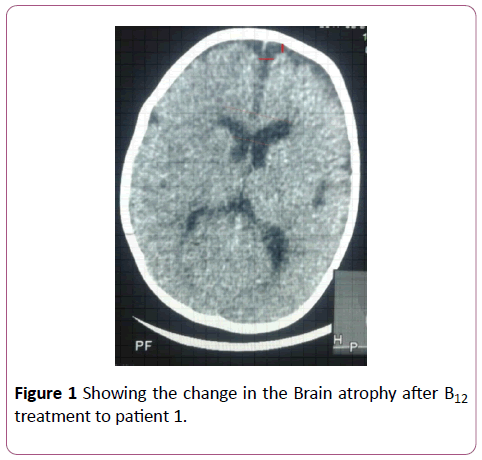 Before treatment: Number of children with mild cerebral atrophy before treatment was 15 (46%) and SD 0.04 and 10 children with moderate cerebral atrophy (31.3%) SD 0.05, the number of children with severe brain atrophies before treatment 7 (21.9%) SD 0.13. After treatment: The number of children who had normal distance between the sylvius fissures were 31 (96.9%) and one child has moderate cerebral atrophy according to Sylvian fissures and no case is left with severe atrophy after treatment (Figures 1-5). Figure 1: Comparison of the predicted vs observed erythrocyte EPA+DHA (Omega-3 index) in 49 samples. Omega-3 index= 1.0 ÃÂ DBS EPA+DHA -0.000049, r=0.96. Figure 2: Comparison of the predicted vs observed erythrocyte EPA+DHA (Omega-3 index) in 49 samples. Omega-3 index= 1.0 ÃÂ DBS EPA+DHA -0.000049, r=0.96. Figure 3: Comparison of the predicted vs observed erythrocyte EPA+DHA (Omega-3 index) in 49 samples. Omega-3 index= 1.0 ÃÂ DBS EPA+DHA -0.000049, r=0.96. Figure 4: Comparison of the predicted vs observed erythrocyte EPA+DHA (Omega-3 index) in 49 samples. Omega-3 index= 1.0 ÃÂ DBS EPA+DHA -0.000049, r=0.96. Figure 5: Comparison of the predicted vs observed erythrocyte EPA+DHA (Omega-3 index) in 49 samples. Omega-3 index= 1.0 ÃÂ DBS EPA+DHA -0.000049, r=0.96. Pre-treatment: 22 children with mild cerebral atrophy 68.7%. With median 0.77 cm and SD 0.08 cm and 5 childre with moderate cerebral atrophy with median 0.98 cm and SD 0.07 cm and 5 children with severe cerebral atrophy (15.6%) with median 1.28 cm and SD 0.11 cm. After treatment: 25 children with normal limit width (78.1%) (Median=0.28, SD 0.12) 6 children have mild cerebral atrophy with (18.8%) (Median=0.74, SD 0.10) One child still has severe cerebral atrophy. There are significant differences in the value of the distance between pre and post treatment. And this result according to the probability value (p-value=0.001) which is smaller than the moral level (0.05). There are statistically significant differences in the value of the pre-treatment distance and the magnitude of the probability value (p-value=0.001). In this study, we found that some images improvement in Sylvian fissures before subarachnoid spaces. There were no significant differences between the degrees of atrophy and the vitamin concentration of the value of probability (p-value =0.717), which is greater than the level of p-value (0.05) (Tables 1-9). Table 1: Degree of cerebral atrophy before treatment (width between Sylvian fissures). Table 2: Degree of cerebral atrophy before and after treatment (width of sylvius fissures). Table 3: The change in the values of the distance between the sylvius and the subarachnoid distance before and after treatment. Table 4: Several statistical criteria for subarachnoid distance before treatment. Table 5: Several statistical criteria for subarachnoid distance after treatment. Degree of cerebral atrophy according to subarachnoid distances. Table 6: Showing degree of cerebral atrophy according to subarachnoid distances. Table 7: Table shows several statistical criteria for Vitamin B12. Table 8: Table shows several statistical criteria (Max, Min, SD and Median) for vitamin B12. Table 9: Table shows several statistical criteria (Proportion and number) for Vitamin B12. In this study ~96.8 of all cases response to treatment with Vitamin B12 completely. Vitamin B12 is a vitamin which is important for the development of the nervous system in children. However, the mechanism it plays in development of the nervous system is still not fully understood [10,11]. This vitamin plays a role as a cofactor in the re-methylation of homocysteine and methyl malonyl CoA degradation. Vitamin B12 deficiency is thought to cause accumulation of guanidoacetate, leading to neurotoxicity. These may lead to demyelination, axonal degeneration, and neuronal death [12,13] Even though clinical signs of Vitamin B12 deficiency have been described half a century ago , studies on radiological findings are limited [11 and 15-17] Determined common radiological findings in the studies which are mostly case reposts has been cerebral atrophy. Taskesen et al., in their recently published study, determined abnormal MRI in 10 (67%) of 15 infants with Vitamin B12 deficiency, and the most often determined findings were thinning of the corpus callosum and brain atrophy [15-17]. Lövblad et al. 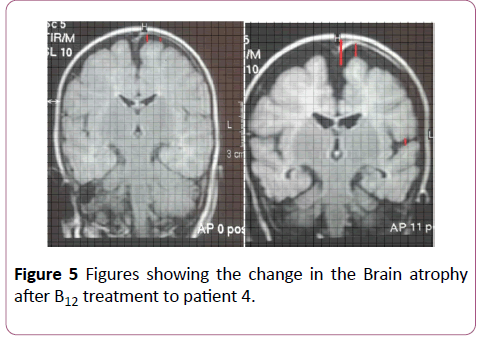 found MRI of the brain revealed severe brain atrophy with signs of retarded myelination, the frontal and temporal lobes being most severely affected in their case report in this study, we found that some images improvement in Sylvian fissures before subarachnoid spaces. There are several possible explanations for the discrepancy. First, cortical thickness in Sylvian fissures measurements may be more sensitive for treatment in than subarachnoid spaces, we need more study to know the most region in brain sensitive to treatment with Vitamin B12 and the first region effects in deficiency, temporal or frontal region. Lam et al. found small pons, partial vermian dysgenesis, and abnormal signal in both basal ganglia with MRI in one patient. Vitamin B12 required for the development of the central nervous system in children. Brain MRI thinning of the corpus callosum and brain atrophy should alert the radiologist for Vitamin B12 deficiency in children. After treatment, radiological response was usually positive in 96.8% in our study. As neuroimaging indicator to follow-up the response numerically for the therapy and diagnosis for the cases with Vitamin B12 deficiency. The clinical picture is the most important factor for the diagnosis of Vitamin B12 deficiency because there is no diagnostic laboratory test, in our study 68.7% of the patients have normal B12 concentration and the diagnosed done by the clinical picture and neurological examination, blood smear and radiological study. When there is a discrepancy between laboratory results, serum Vitamin B12 and strong clinical suspicion, treatment should not be delayed to avoid non-reversible neurodegenerative changes . Cobalamin is important for the rapid development of nervous system . Long-term effects of a temporary moderate deficiency are unknown, but cobalamin deficiency should be considered in young, mainly breastfed infants with feeding difficulties, subtle neurologic symptoms, and delayed motor development. We thank all mothers and infants for their participation in the study. Stiles J, Jernigan TL (2010) The basics of brain development. Neuropsychol Rev 20(4): 327-348. Rosenblatt DS, Whitehead VM (1999) Cobalamin and folate deficiency: acquired and hereditary disorders in children. Semin Hematol 36(1): 19-34. Zengin E, Sarper N, Caki Kilic S (2009) Clinical manifestations of infants with nutritional vitamin B deficiency due to maternal dietary deficiency. Acta Paediatr 98(1): 98-102. McPhee AJ, Davidson GP, Leahy M, Beare T (1988) Vitamin B12 deficiency in a breast fed infant. Arch Dis Child 63 (8): 921-923. Graham SM, Arvela OM, Wise GA (1992) Long-term neurologic consequences of nutritional vitamin B12 deficiency in infants. J Pediatr 121(5): 710-714. Black MM (2008) Effects of vitamin B12 and folate deficiency on brain development in children. Food Nutr Bull 29(2): 126-131. Georgieff MK (2007) Nutrition and the developing brain: nutrient priorities and measurement. Am J Clin Nutr 85(2): 614-620. J. Eric PiÃÂ±a-Garza, MD (1993) Fenichel's clinical pediatric neurology book, Disorders of Cranial Volume and Shape pp: 350. Black MM (2008) Effects of vitamin B12 and folate deficiency on brain development in children. Food Nutr Bull 29(Suppl 2): 126-131. LÃÂ¶vblad K, Ramelli G, Remonda L, Nirkko AC, Ozdoba C, et al. (1997) Retardation of myelination due to dietary vitamin B12 deficiency: cranial MRI findings. Pediatr Radiol 27(2): 155-158. Emadfa I, Singer I (2009) Vitamin B12 and homocysteine status among vegetarians: A global perspective. Am J Clin Nutr 89(5): 1693-1698. Graham SM, Arvela OM, Wise GA (1992) Long-term neurological consequences of nutritional VB12 deficiency in infants. J Pediatr 121(5): 710-714. Honzik T, Adamovicova M, Smolka V, Magner M, Hruba E, et al. (2010) Clinical presentation and metabolic consequences in 40 breastfed infants with nutritional vitamin B12 deficiency-what have we learned?. Eur J Paediatr Neurol 14(6): 488-495. 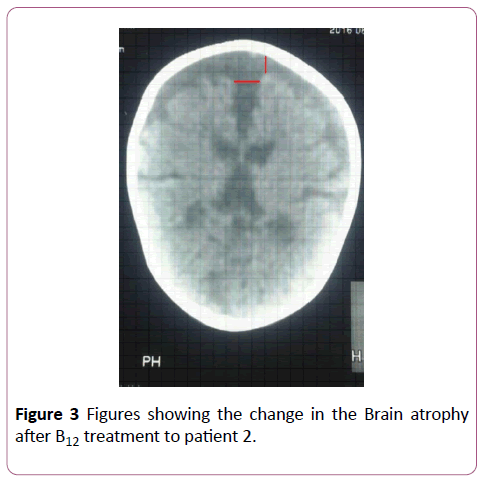 Taskesen M, Yaramis A, PirinÃÂ§cioglu AG, Ekici F (2011) Cranial magnetic resonance imaging findings of nutritional B12 deficiency in 15 hypotonic infants. Eur J Paediatr Neurol 16(3): 266-270. Von Schenck U, Gotze CB, Koletzko B (1997) Persistence of neurological damage induced by dietary vitamin B12 deficiency in infancy. Arch Dis Child 77(2): 137-139. Horstmann M, Neumaier-Probst E, Lukacs Z, Steinfeld R, Ullrich K, et al. (2003) Infantile cobalamin deficiency with cerebral lactate accumulation and sustained choline depletion. Neuropediatrics 34(5): 261-264. Devalia V, Hamilton MS, Molloy AM (2014) Guidelines for the diagnosis and treatment of cobalamin and folate disorders. Br J Haematol 166(4): 496-513. Rosenblatt DS, Cooper BA (1990) Inherited disorders of vitamin B12 utilization. Bioessays 12(7): 331-334.